When examining athletes that have qualified for the IRONMAN World Championships, there are many common attributes throughout each age group. The levels of competition are so strong that there is no accidental way of rising to the top. It is harder and harder to qualify with more IRONMAN events worldwide and limited spots to race in Kona. To be able to stand on the podium at any IRONMAN, all the competitors arrive with peak preparation- they are in their best physical shape. What sets the champions apart is their mental edge, which is cultivated intentionally in training and through past race experiences. In my many years of coaching I have come to see some common themes in mental traits shared by top age group athletes. The number one attribute is commitment to the A-race goal. The majority of age group athletes have incredibly busy lives; many work demanding full time jobs and will often have a family as well. The athletes that make it to Kona are those who, with the support of their spouse or significant other, make it their priority to commit to getting the required training in. They review their training schedule in TrainingPeaks the week prior. They then plan their work/social schedule with the completion of training being the number one goal. If this means joining a 6:00am Masters Group or getting up at 5:00am for a trainer session, that is what they do. They then figure out how to fit everything else in their life around it. To balance the long and arduous physical preparation of reaching the top, champions consistently maintain a positive mental attitude. Racing the IRONMAN distance as an amateur is tough and there is no financial reward. This doesn’t mean there aren’t moments of down, but overall thoughts are positive – this is reflected in the adage, if it was easy, everyone would do it! Therefore it must be a passion. One can’t put in 15 to 20 hour training weeks without a positive mental attitude and a strong sense of self-motivation to assist getting up early mornings and heading out when it’s cold and dark. Along with the positive attitude is the use of positive imagery. They show up to practice ready to embrace the workout, whatever the coach prescribes. Successful qualifiers will visualize their success as they train. In their mind they will see themselves exiting the water after a strong swim, cresting a hill with a sense of power and even running through the finishing chute as a champion. They will also have cues as to how they will to feel on certain parts of the course. By the same token they have to ability to compartmentalize. If a particular workout doesn’t go well, there is the immediate reflection of what happened and why. Then it is put aside and the athlete will move on to the next one. No dwelling on the past. The athlete has a strong self-belief in their abilities which is backed up by their previous training data. Preparing for and racing an IRONMAN is not a venture one undertakes if one is seeking an instant reward. Getting to the start line healthy and strong requires that all the building blocks along the way were set in place properly and in the correct order. This is a process that takes years, not months or weeks. And that is just to get to the start line. Once the gun fires, an IRONMAN day unfolds steadily minute by minute, hour by hour. When they are racing, champions don’t get ahead of where they are in the race. They focus their mental energy on getting the most out of their body at that moment. If it’s a tough part of the swim they are thinking about perfect technique for every stroke. On a climb, if a competitor is pulling away, they focus on pushing with a power they can maintain. It is necessary to stay in the moment. I often say to my athletes you don’t “race” the IRONMAN until the second half of the marathon. You can’t control who shows up to an event. Kona qualifiers perform on the day to the best of their own abilities and don’t get carried away with who else is there or what they are doing. Many things can happen during an IRONMAN and will immediately change the day, whether it is a mechanical, poor pacing or nutritional mistake. From consistent training, the top athletes know their swim splits, power outputs on the bike and run paces. They know there is no magic piece of equipment that is going to make them go 20% or 30% faster. They know exactly what they are capable of and stick to the plan they set out with their coach. This confidence comes partially from the physical preparation for the event. They are also methodical. Everything related to racing the IRONMAN is laid out beforehand. In the months leading up to the race all equipment is tried and tested, discarded if it doesn’t fit or work. Nutritional plans are dialed in regularly on training rides and runs. As I have written about in the past pre-riding the course or simulating the terrain during takes the guesswork out come race day. This way there is no last minute scrambling or unsureness whether something is. I have often heard my athletes being labelled tough in the face of adversity. Especially after a race that was cold or held in terrible conditions. Or how a racer recovered after an especially bad patch on the run. I prefer to look at this as that athlete staying in the moment and just focusing on what they can do right then. If they can’t run, at least walk fast; if they are grumpy and low in energy, have something to eat. The important thing is that champions look for the best option for any given situation. They also anticipate the hard parts of the course and prepare for the physical discomfort. These sections are opportunities, not a section to dread. There are many factors that play a part in how champions rise to the top; the mental game is definitely just as important as being physically prepared. 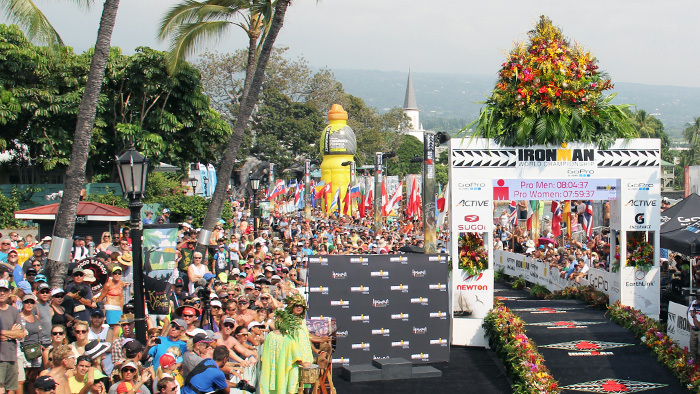 Watch this video to hear the best tips from athletes that raced the 2015 IRONMAN World Championships.